Q: My mother lives out of town. I know she needs to move to a senior community but I also know she doesn’t want to leave her home. And the stuff she has accumulated is monumental. Any suggestions? A: We hear this concern from adult children often. 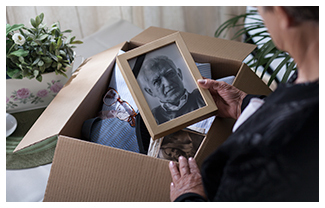 Sorting through and packing up a lifetime of memories and belongings can be overwhelming. One resource we like to share with families is a group of professionals called Senior Move Managers. They are a national group of individuals who specialize in moving seniors out of their homes into a senior community. They are experts at handling all of the details of a later life move. You can find one near your home by visiting the National Association of Senior Move Managers or Certified Relocation & Transition Specialist. Q: My mom recently passed away and my dad has agreed that it was time for him to move to an assisted living community. He admits he just isn’t safe living alone. We found a community that appears to be able to meet his needs that’s close to our house. Now we can’t seem to get him motivated to actually make the move. I’m afraid he is going to change his mind. How can we encourage him to take the final step and move in? A: This sometimes happens when it actually comes time to make the move. Your dad is probably anxious not to mention uncertain. A late life transition like this isn’t easy to make. What might help is to get him involved in some of the events and activities at the new community now, instead of waiting until he actually makes the move. Talk with the staff to see about helping him find a buddy with similar interests and hobbies that he can bond with during his visits. Becoming more familiar with the community and with a few fellow like-minded residents can help make the move feel far more comfortable. Q: When I visit the various communities with my daughter, I find it all a little intimidating. Moving from my house to a big community is frightening. I just don’t know if I can learn my way around a new place. A: We understand this is a big change! It is a concern we often hear from those considering a move. The good news is that there will be staff and fellow residents around who will be happy to welcome you and make certain you are comfortable in the new surroundings. Before long you will find yourself feeling right at home! And, your life will have fare more convenience, freedom and independence. That’s one of the “myths” that exists in some individuals’ minds. Once moved in, their lives are enhanced in ways they could not even imagine. https://neillsvilleretirement.com/wp-content/uploads/2017/03/resources_TheMove.jpg 208 325 graphiclux http://asterseniorcommunities.com/neillsville/wp-content/uploads/2018/05/Neillsville-logo-HR-300x110.jpg graphiclux2017-03-24 10:28:542017-03-31 14:45:20Making "The Move"